On Jan. 27 at 5:30 p.m., the Kansas City campus will host a special Charter Day reception with special guest Pastor Cliff Caton of First Christian Church of Blue Springs, who will be donating his grandmother's original 1917 Christian Female College diploma to our campus. It will be an honor to display this historic document on campus, demonstrating the long and distinguished lineage of college service to our community and to the State of Missouri. Last week the entire Columbia College community celebrated its 163rd Charter Day. 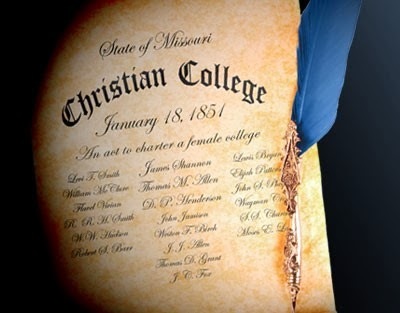 On Jan. 18, 1851, Christian Female College received its charter from the Missouri Legislature, making it the first women's college west of the Mississippi. The college as a whole recognized Charter Day on Thursday, Jan. 16. The reception will be attended by guests from Columbia College Development, Alumni and Public Relations at the main campus. Students, faculty, staff and alumni are encouraged to attend! Please RSVP to Director Cindy Miller at cmiller@ccis.edu. Please join us for this momentous occasion!